And, the current me, heading into my 30s, seems to be concerned with more issues than mere breakouts. Dryness, cracking, scaliness, flare-ups, hyperpigmentation and above all, premature aging keep coming back and forth. Then, I have learned a lot about hydration as a centerpiece of the largest organ’s lifeforce, regardless your skin is dry, oily or everything in-between. Now, I’m just looking for something that treats my skin kindly rather than mask the things with a made-up look. Instead of foundation, I prefer using a tinted moisturizer which makes me upfront with my own skin. It’s meant to impart everyday glam with a moist, healthy complexion. 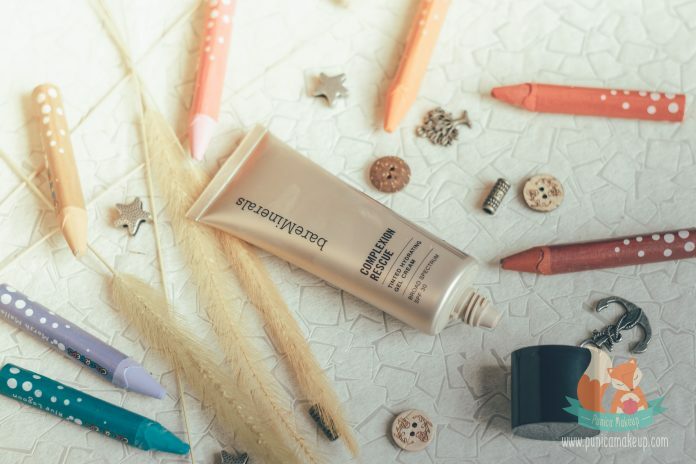 Let’s get down to my review of BareMinerals – Complexion Rescue Tinted Hydrating Gel Cream Broad Spectrum SPF 30, among goodies I have been using recently. Besides, I decided to put it in my list of 10 best foundations for dry skin. The product supposedly delivers a burst of hydration leaving a celestial glow, complexion correction with sheer to medium coverage and broad-spectrum SPF 30. Fitting for everyday wearing. It’s the Allure award winner as one of the best-tinted moisturizers. Noted with 215% boost in skin hydration and remarkable improvements in skin texture after one week. Infused with Coconut Alkanes, Glycerin and Squalane as emollients and humectants. This three help regulate the evaporation of water from skin and increase its moisture reservoir. Coconut Alkanes usually goes hand in hand with Coco-caprylate/Caprate, another emollient included in the formula, for a velvety feel to the touch. Coconut Alkanes is considered clogging pores, so maybe the ingredient is not suitable for oily and acne-prone skins. FYI, Squalane is produced from the hydrogenation process of Squalene, which is commonly found in olive oil, shark oil, wheat germ, rice bran and vegetable oils. That makes Squalane become completely saturated oil (fat), compared to the unsaturated nature of Squalene. It helps moisturize skin with a very lightweight, non-greasy consistency that will not provoke congestion. Plus, some fun facts about it come to a question. why is Squalane seemingly more desirable than Squalene and unsaturated oils (fats) in general, regarding to ointments? Saturated oils (fat), like coconut oil and squalane, contain single bonds within their fatty acid chains. They are more likely to be stable and resilient against the oxidative stress of environmental perils. Unlike unsaturated oil, which consists of at least one double bond, is less stable and goes rancid (or oxidised) fast, when exposed to air, light, heat and pollution. It’s likely fraught with a shorter shelf life and skin premature aging. Actually, unsaturated oils are still used in skincare products though. Olive, avocado, sunflower and grapeseed oils are unsaturated, they are abundant in emollients and fatty (Linoleic acid and Oleic) acids. Often added with Tocopherol or vitamin E as an antioxidant and natural preservative to counteract their oxidation. Go back to our main point. The tinted moisturizer is enriched with Globularia Cordifolia Callus Culture (Globe Daisy), Salicornia Herbacea (Glasswort) and Melilotus Officinalis (Sweet Clover) extracts. These botanical-derived ingredients provide soothing, hydrating, brightening and age-defying properties, but also enhance skin’s glow. Aside from the nourishing plant extracts, the formula comprises energising minerals, including Magnesium Chloride, Potassium Chloride and Calcium Chloride. These potent electrolytes attract water into the outermost layer of skin and improve transepidermal water loss as well as expedite skin cell growth and self-restorability. Hence, that helps fortify skin protective barrier, while mitigating the appearance of fatigue and premature aging signs. Moreover, formulated with many chemical compounds. Caprylic/Capric Triglyceride, Propanediol, Trehalose and Sodium Hyaluronate (Hyaluronic Acid) together work as replenishing emollients and lubricants. They minimize skin dryness and bind in moisture. Propanediol is possibly used to dilute other active ingredients in the formula. Agar, Cellulose Gum, Isostearic Acid and Magnesium Stearate bring about thickening, binding, emulsifying, film forming, texture enhancing activities. Silica acts as an absorbent to absorb oil and sweat for long-wearing, amplifies the product’s spreadability and prevents pigments from settling in makeup. Another absorbent is Magnesium Hydroxide, which also functions as pH adjuster. Lauroyl Lysine, Butylene glycol and Succinoglycan do their jobs as conditioning agents. Though Butylene glycol can be a thickener, solvent and viscosity decreasing agent for a smooth, feather-like texture on skin. Likewise, Lauroyl lysine can be a surfactant as well. Some other versatile surfactants and emulsifiers include Sorbitan Sesquiisostearate, Polyglyceryl-4 laurate/Succinate and Polysorbate 60. There are some preservatives, like Potassium Sorbate and Phenoxyethanol. Potassium Sorbate is an antimicrobial and antifungal as an alternative of Paraben. The formula contains mineral pigments (Titanium Dioxide, Iron Oxides). Last but not least, its active ingredient is Titanium Dioxide (6.2%), a mineral UV filter for the broad spectrum sun protection. Before swiping on the entire face, I usually get a habit of doing swatch on the back of my hand or my jawline to compare the color and my skin tone. I got Opal 1, which is supposedly a fairest shade with cool undertones. My skin is quite pale so I chose it and hoped that it would be fitting for my skin color. Turns out that it’s not a match. The shade seems deeper than mine. To be exact, it’s quite tan and orangey on my skin. I really want this to match the color of my neck and body, so that I can make it my natural glam on a daily basis. Well, to fix the problem, mix two or three drops of the product with a drop of NYX Pro Foundation Mixer in White to lighten the shade up a little bit. This is my handyman, it will not distort the formula of the tinted moisturizer. Just try not to squeeze out the Foundation Mixer too much, the coatings may end up getting chunky. It does not matter, whether you like applying with fingertips or a makeup brush. Easy to diffuse smoothly on bare skin. To me, I can make it snappy with my fingertips like applying a sunscreen. The product is allegedly broad spectrum SPF 30-infused, Titanium dioxide (6.2%). wearing sun protection every morning is sure important, especially when outdoors. That may not be the case, Titanium dioxide is not completely broad-spectrum though. It can not block the longer range of UVA. I still wish that the formula would have one more sunblock active, Zinc Oxide, which definitely shields the whole ranges of UV rays. Occasionally, I’d love to take a few drops on the back of my hand and load it evenly into a flat foundation brush. Then, diffuse all over my face. Also, gently buff it in to build more coverage. Then, sweep on some setting powder to make the foundation last throughout the day. At once, I can find genuinely hydrating and cooling sensations, which make my skin more awake. The product has gel-like consistency that is effortlessly sleek onto the surface and plumps skin texture, delivering a moist, gleaming finish. This is obviously suitable for dry skin type. Otherwise, my skin often switches to the shiny, oily mode during the summertime, the product may eventually aggravate the sheen, oil production and congestion. Thus, I’d like to apply translucent powder on top to keep the oil breaking through. The tinted moisturizer tends to impart sheer to medium coverage, naturally blurring dark spots, discoloration and some minor pimples. I think the coverage is pretty damn good. To deal with peskier imperfections, like blistering blemishes or whopping acne scars, dab on a little concealer. But, I will not make a fuss about it, I just crave a natural, breathable canvas as much as possible. 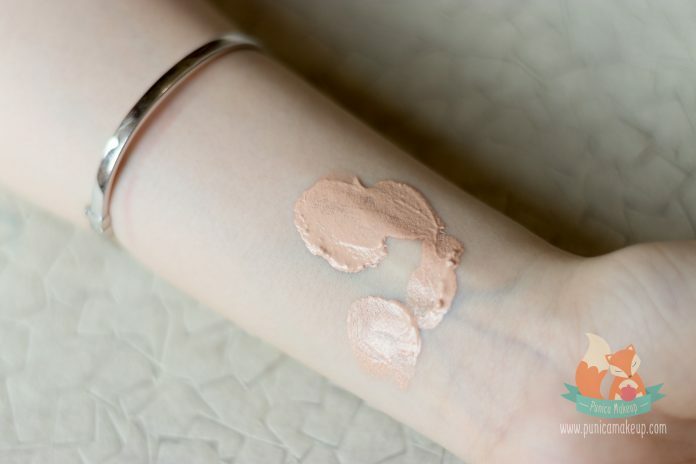 Compared to my IOPE – Air Cushion Matte Longwear I bought earlier, the BareMineral Complexion Rescue Tinted Moisturizer gives better coverage and moisturization. Speaking of the product’s moisturizing property, I tried applying it right after my toner and serum a couple of times. Toner, serum and next, moisturizing cream have been ingrained in my skincare routine prior to putting any makeup on though. I wanted to test how well it was able to keep my skin hydrated all day long, in place of my moisturizing cream. Meanwhile, I had been suffering from severe dry flakes, scaliness and redness for more than 6 months. Well, the product sure made skin hold onto moisture, yet not very long for the whole day. It lasted for 6 to 7 hours. Afterward, my complexion started getting dehydrated and cracking, mostly around my chin. It even pronounced some fine lines on my forehead and under my eyes. Additionally, its coverage also came off little by little and caused subtle streaks or patches, but it was not sliding badly. I’d highly recommend the tinted moisturizer to normal/combination, sensitive and indeed, dry skin types. If you are plagued by very dry, scaly skin as I used to be back then, you should follow all of your skincare steps beforehand to ensure that your skin can stay hydrated throughout the day. Furthermore, good thing is that it does not contain irritants, typically fragrances, alcohol derivatives and chemical sunscreen actives. Therefore, it’s less likely to upset your delicate skin. Housed in a plastic bronzy tube in a satin finish which easily gets stains by a dash of powder or foundation. And, it’s hard to clean it off. I really like the idea of foundations in tubes, I don’t have to put my filthy fingers into the entire foundation. The tube is more sanitary than the twist-off jars or pots, it foils bacteria and microorganism from spoiling the product. The packaging is light and well-shaped for on-the-go uses. It’s tough to withstand physical damage. You can see the foundation shade on the back of the tube. I think the product gives nice moisturization and decent coverage for a no-makeup makeup look. Nevertheless, I’m an advocate of doing an extra step of moisturizing cream when skin gets horrendously dry, especially in winter. I’ll give it 8 out of 10. 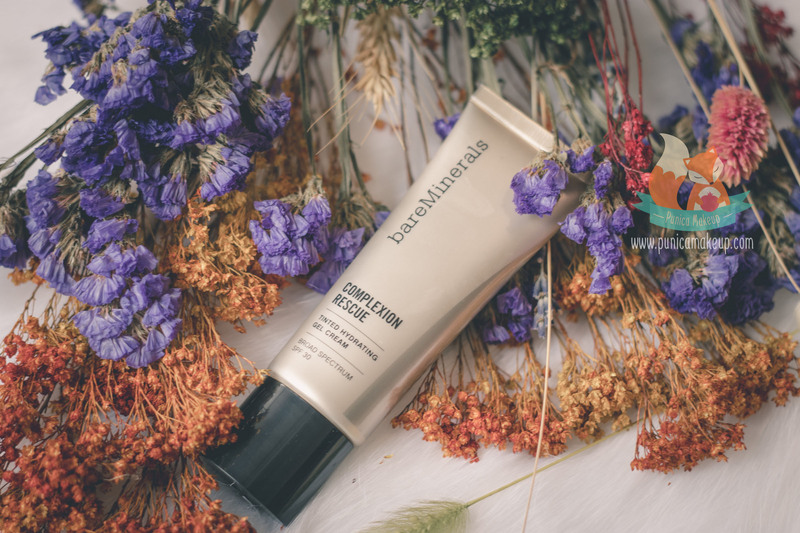 This is my very personal and candid review for BareMinerals – Complexion Rescue Tinted Hydrating Gel Cream Broad Spectrum SPF 30. I hope this is helpful and gives in-depth information. If you have any questions or ideas, I’d love to know. Thank you so much for your time!